Another hugely popular name returning to Wickham in 2018, Roy Bailey has been described as the very soul of folk’s working class roots. In 2003 he won the Best Live Act award from BBC Radio 2 Folk awards after teaming up with none other than Tony Benn. The Labour MP described Roy as “the greatest socialist folk singer of his generation”, Roy returned his MBE for services to folk music in protest at the Government’s foreign policy in Lebanon and Palestine. 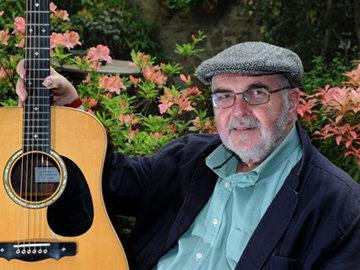 For 50+ years, Roy Bailey has been one of the UK Folk & Acoustic scene’s most loved and admired performers. From his early days performing skiffle in student union bars, to his love of traditional songs and the stories they tell, onto developing a unique repertoire of songs of dissent and hope, he has performed on stages, TV and radio all over the world. In 2000 he was awarded an MBE for Services to Folk Music – an Award he later returned in protest at the Government’s Foreign Policy. In 1990 Roy and Tony Benn first presented their show ‘The Writing on the Wall’ for which the duo won Best Live Act at BBC Radio 2 Folk Awards in 2003. The show has been performed to enthusiastic audiences the length and breadth of the UK. From 300 people in Working Men’s Clubs, to an estimated 9000 people at Cambridge Folk Festival in 2000. Roy’s association with Tony began in 1976 and they worked together on various programmes up to Tony’s sad death in 2014. Now with more than 50 years as a performer, Roy is as compelling, entertaining, thought provoking and moving as ever before. Colin Irwin writes of Roy’s CD ‘Below the Radar’ as being “… so impeccable it must surely merit consideration as the best thing he’s ever done.” (fRoots June 2009). Approaching 80 years of age, Roy remains committed to his life-long principles of Equality, Liberty, Justice and Internationalism. He is a member of the current Anti-Capitalist Roadshow along with many of this country’s leading and respected socialist folk singers and song writers.